Test-driven Development is a programming practice that instructs developers to write new code only if an automated test has failed, and to eliminate duplication. The goal of TDD is clean code that works. For every bit of functionality, you first develop a test that specifies and validates what the code will do. You must begin by writing a unit test for the functionality that you intend to write. But by rule 2, you can’t write very much of that unit test. As soon as the unit test code fails to compile, or fails an assertion, you must stop and write production code. But by rule 3 you can only write the production code that makes the test compile or pass, and no more. Test-driven development is related to, but different from acceptance test–driven development(ATDD). TDD is primarily a developer’s tool to help create well-written unit of code (function, class, or module) that correctly performs a set of operations. 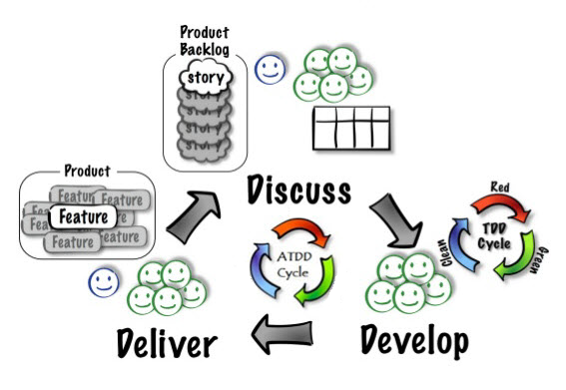 ATDD is a communication tool between the customer, developer, and tester to ensure that the requirements are well-defined. TDD requires test automation. ATDD does not, although automation helps with regression testing. Tests used in TDD can often be derived from ATDD tests, since the code units implement some portion of a requirement. ATDD tests should be readable by the customer. TDD tests do not need to be.